Having attended the Berkeley Kite Festival at least six times myself since 1992, I was a bit anxious at the possibility of missing this years event… With things working out for me at the last minute, my kite partner Moon and I took the trip down to experience an event that has been one of the most consistent ongoing cornerstones of west coast kite festivals. Arriving late Friday night at the Oakland Airport we met my old friend from Berkeley, Dan Gray who took us down to the event host Doubletree Hotel for a late check in… And a few precious hours of sleep. 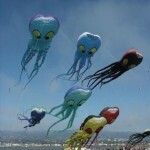 One major difference this year was that the sport kite competition was moved to the lower field in order to provide more “up front” exposure of demos and displays for the thousands of spectators that attend Berkeley every year. Run completely by Susan Skinner and her BASKL staff this year, there were 40 entrants as opposed to only 30 in 2002… Despite a premature rumor that there would be no comps at Berkeley this year. Regardless, there were excellent performances from quite a few loyal fliers, local and otherwise. 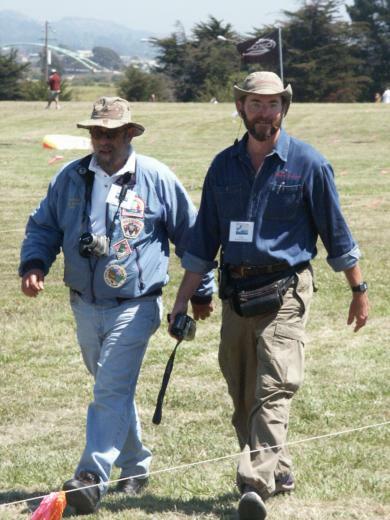 On the upper field there was a full sky thanks to Al Sparling, David Gomberg, Dave Hoggan, Dan Whitney and others… On Saturday they had six Takos in the air… Upping the ante to eight on Sunday! Also on display were giant inflatable Teddy Bears which are always a huge hit with the family-oriented spectators. As you’ll see from the pictures in the separate gallery we managed to avoid a tangled mess, with me dodging all over the place and trying not to hit anyone… It really was the best time I’ve had in a while, we even went out and did it again on Sunday! A huge thanks to Jeanette, Mark, Barry, Gordon and Ken for letting me play on their kites… It really did feel like a “Big Show”. With the crowds having started coming quite early, I saw them coming into the park in droves of 30-50 at a time… Just coming down the street like mice to a piper! There were so many people, you had to zig-zag through the families camped out to get up to the sound tent! It wasn’t congested, but there were a lot of people sitting down to stay a while and enjoy the show as well as partaking in some some excellent food vendors. 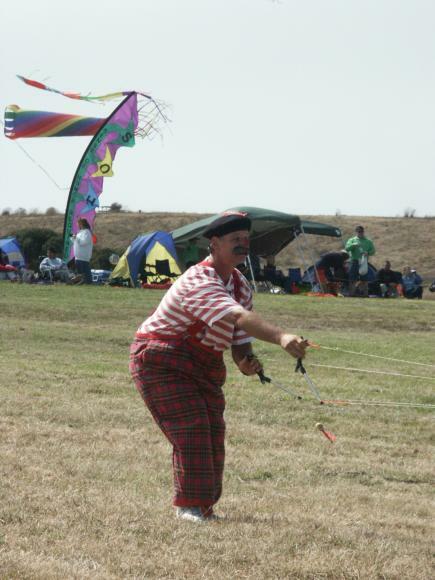 Ray Bethell was also on hand to demonstrate his world famous skills flying 3 kites at once… His custom red, white and blue Kestrels were the hit of the day! He was assisted as always by good friends Fred and Gerry Adler. On Saturday night there was a reception at the Doubletree with a good spread of appetizers and the ever-present cash bar. Although the crowds arrived slightly later on Sunday morning, they were back in full swing by 1 o’ clock… Coming back for more demos were the Bay Area Sundowners, Too Much Fun, Air Zone, Ron Despojado, Avispados and many others. With as many kites as there were in the air on all fields, there were surprisingly few entanglements… Even the kids from J.R. Tolman’s kite making workshop were having a blast! After getting back to hotel and cleaning up, we headed down to dock behind our hotel where the Princess Hornblower was waiting to take us on a sunset cruise banquet around the beautiful San Francisco bay… With two levels and a deck around the outside top and bottom, there was a silent auction and some seating upstairs. Downstairs was the primary seating, stage and a cash bar. 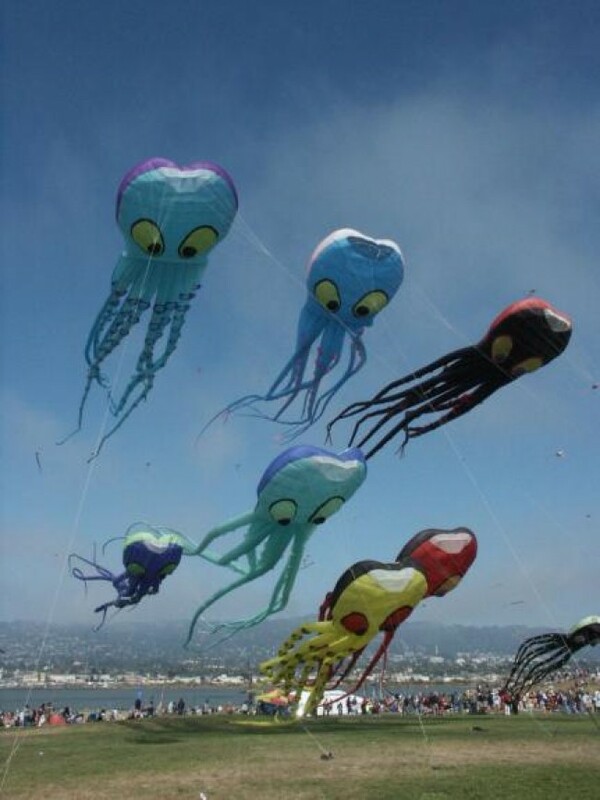 Having been a part of the Bay Area kite culture for over a decade myself, it’s always nice to see so many people having done so much for the event for so long… There were many sentimental thanks all around, bringing a tear or two to say the least. 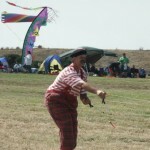 One of the most notable was a special award for Susan Skinner, who with the Bay Area Sport Kite League devoted a great deal of time and energy to making sure there would still be sport kite competition at this years Berkeley. 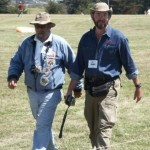 Having taken nearly 600 photos at this event, I must have been up and down that field a hundred times! I’ve picked some of the best and included them in the photo gallery in this issue… There will be more coverage included in an upcoming issue of the AKA‘s Kiting Magazine. This entry was posted in 2003, Events / Festivals, Issue 31 (Jul/Aug), KL Archive, Reports and tagged berkeley, california, festival.